It's the last week of school before Winter Break. Winter. Break. 4 more days and school is over for 2016. Is anyone else wondering how that happened? In any case, I needed cards to go with our holiday gifts for the boys' teachers. Luckily it's Monday, so there was a new sketch from Atlantic Hearts Sketch Challenge. I grabbed some of the pieces I'd already diecut from Cozy Christmas and got to work. I have some glitter card bases that have been in my stash for so long I can't even remember where I got them. I layered on some City Sidewalks papers left from finishing my Workshops Your Way Kit. 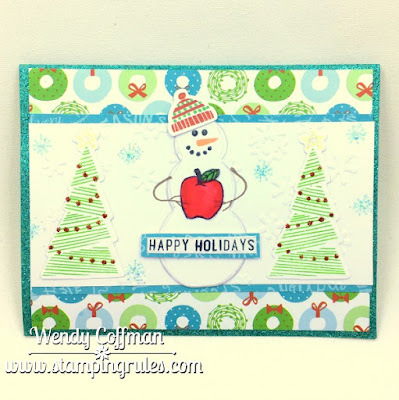 I embossed a white cardstock panel with snowflakes and mounted the diecut stamped images over the snowy background. I knew I wanted to add a bit of teacher theme, so I stamped and colored the apple from School Kids for the snowman to hold. I bent the snowman's arms on the block before stamping them so he could better grasp that shiny red apple. I hope you'll pop over to Atlantic Hearts and try out this fun sketch for yourself! Super cute and I am sure the teachers will LOVE them! I think this adorable little guy needs to be on the card buffet next year! So freaking adorable, as always. I am so glad to have you as my consultant! I will make sure of that Kim! I'm so glad to be back and scrapping with you again. Hugs! 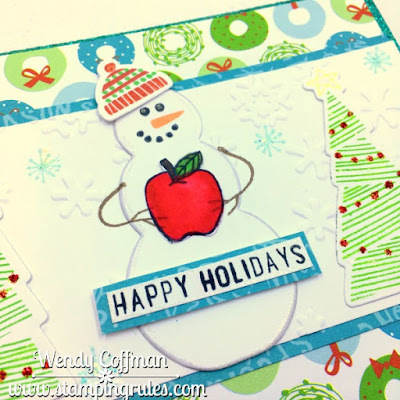 who doesn't love a snowman...and all the embellishments of signs of Christmas...adorable card and great teacher card with adding the apple...creative.